The Forza Vario 8000 has been developed specially for transportation of large amounts of water at low pressure. Thanks to its big impeller wings even heavily polluted water can be displaced easily (up to 10mm waste particles). 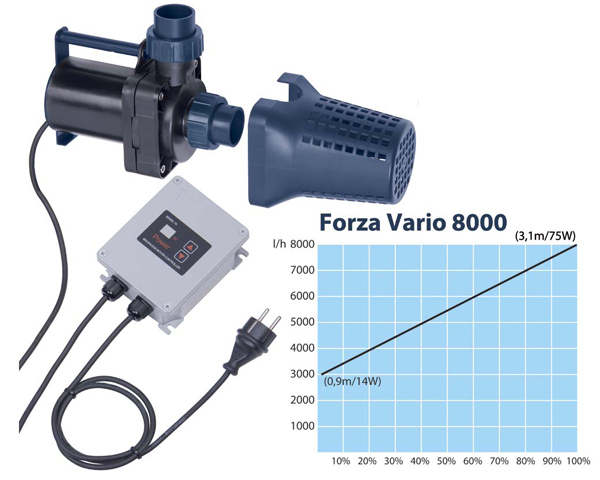 An extra advantage of this pump is that you have control over the power consumption, and thus the capacity, to save even more energy in times you don’t need the maximum capacity (winter!). The Vario pump consumes 25% less energy than a conventional pump. Comes complete with 1.5 inch split unions !